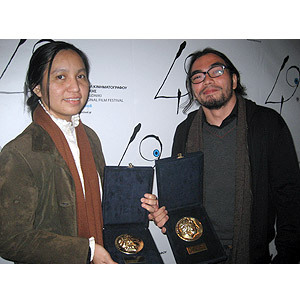 Sid Lucero and Emilio Garcia win in Greece for "Selda"
Selda directors Ellen Ramos (left) and Paolo Villaluna show off the awards that they received during the 49th Thessaloniki International Film Festival last November 23 in Greece. Their lead stars Sid Lucero and Emilio Garcia, who shared the Best Actor plum, were unable to attend the event. Sid Lucero and Emilio Garcia won the Best Actor Award for Selda (international title: The Inmate) at the 49th Thessaloniki International Film Festival held last November 23 in Greece. Directors Paolo Villaluna and Ellen Ramos accepted the award in behalf of their two stars. It is the first time in the 49-year history of Thessaloniki IFF that they gave two Best Actor awards for a single film. Selda is also the first Filipino film to be in the main competition of the festival. Jury President Michael Ondaatje, writer of The English Patient (1997), liked the film very much and said that Selda was "a powerful film." Diablo Cody, scriptwriter of Juno (2007) and member of the jury also told Paolo and Ellen afterwards that she cried after watching the film. "It's "absolutely beautiful," she told the two directors of the film. Also starring Ara Mina, Selda is about a young man (Sid) who is imprisoned and develops a close relationship with another prisoner (Emilio). Selda also competed at the Montreal World Film Festival last August and was also the first Filipino movie to compete in that festival. Brillante Mendoza's Serbis and Francis Xavier Pasion's Jay were also screened during the festival in the Independence Days section. Direk Francis was there to introduce the film while Brillante was supposed to be a member of the jury but did not make it due to conflicts with his schedule. He had just come from a press junket for his film Serbis in New York. Serbis has been acquired for distribution in Greece. Selda and Jay are represented by Ignatius Films Canada and Serbis by Fortissimo Films. The jury of the International Competition Section of the 49th Thessaloniki Film Festival comprised of jury presidentMichael Ondaatje, writer (Canada), Diablo Cody, screenwriter (USA), Yeşim Ustaoğlu, director (Turkey), Lita Stantic, producer (Argentina), Émilie Dequenne, actress (Belgium), David Robinson, film critic (UK), and Dionissis Savopoulos, composer (Greece).